Learn more about this multifamily investment opportunity on Indianapolis' west side here. Opportunity to Acquire Stable Property at Attractive 9.3% Cap Rate on Achievable Forecast NOI: Rental revenue at the property has been trending upward. The offering price represents a 9.3% cap rate on projected NOI and a 7.5% cap rate using trailing 6 months revenue annualized and T-12 months actual expenses. Potential to Increase Rental Rates with Interior Unit Upgrades/Updates: The completion of light interior unit updates (new counter tops, cabinet painting/hardware, new light fixtures and plumbing fixtures, etc.) offers the potential to increase the current market rental rates. Desirable Submarket: Located on Indianapolis’ desirable northwest side, a submarket which has experienced both occupancy and rent growth in 2012. High Visibility Location: Woodbrook is located directly on Georgetown Road a main north/south thoroughfare on the city’s westside with an average daily traffic count of over 22,000. Convenient Location: Two interchanges with Interstate 65 are within 2 miles of the property. Also Interstate 465 (Indianapolis’ interstate beltway) is located only 2 miles away. The downtown CBD and most parts of the city are within 20 minutes of the property via I-465. Shady Tree is NOW Available! Check out our new Multifamily opportunity in Evansville! Foreclosed Property Offered for Quick Sale by Lender: Offers are due on April 26, 2013 and the lender is motivated to complete a quick sale. Low Price Per Unit: Shady Tree is offered at $2,400,000 or just $19,048 per unit. Great Opportunity to Add Value: Shady Tree offers an investor the opportunity to create additional value through modest unit upgrades, landscape enhancements, and the institution of a bill-back program for water and sewer utilities. Located in a Strong Rental Market: Evansville has a healthy economy and an average market occupancy of 93%. and Ivy Tech Community College (2,400 students) are less than a mile from Shady Tree. The north side location is also attractive to workers at multiple manufacturing facilities. Quiet, Country-like Atmosphere: A picturesque creek runs through Shady Tree’s wooded site and the property is bordered by trees on three sides. Attractive Exterior with Mostly Brick: Low maintenance, mostly masonry exteriors enhance the property’s appearance. We have updated our Market information through 2012 year end (visit our Market page to download the PDF). As your source for accurate Indiana Apartment market data, we want to keep our information as up-to-date as possible. 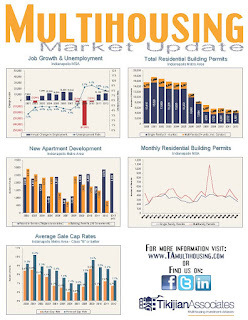 The past year proved to be another successful year for multifamily, with virtually all major markets in Indiana experiencing significant gains in occupancy and rent. 2012 was an active year for apartment sales, with a nearly equal mix of distressed and stable properties selling in the last twelve months. 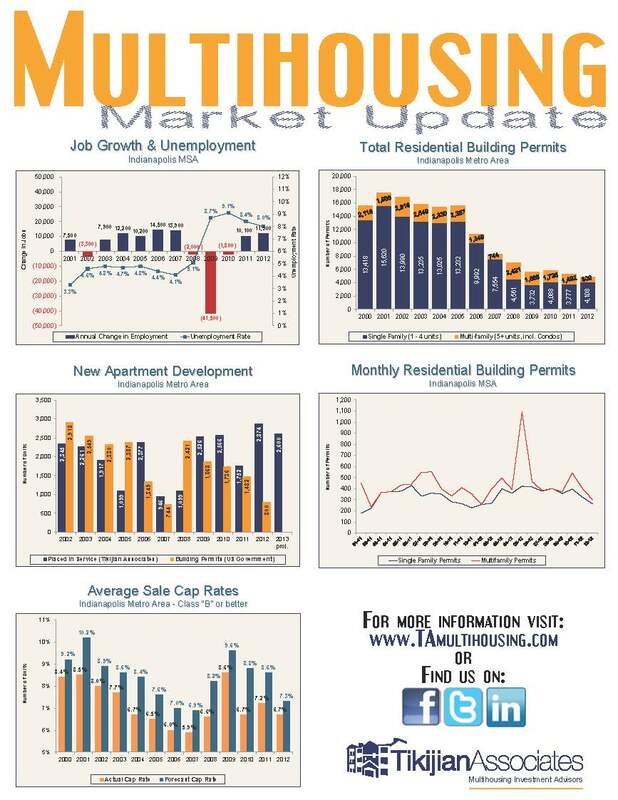 We anticipate solid apartment fundamentals continuing in 2013. We should also see strong pricing for apartment sellers in the coming year, driven by low interest rates, the excellent rental fundamentals mentioned above, and large amounts of investor capital actively seeking the comparatively high yields offered by multifamily investment. Don't forget to check out this exciting multifamily opportunity on the west side of Indianapolis, IN - Suncrest Apartments! One of Newest Properties in Stable Submarket: Completed in 1986, Suncrest is one of the last properties built inside the west leg of Indianapolis’ interstate beltway. The area is now fully-developed, providing a barrier to additional apartment construction. The west side rental submarket is healthy, with occupancy averaging about 91% and rents increasing in 2012. Exceptionally Convenient to Downtown CBD, Interstates and Major Employment Centers: The property’s location very near Interstates I-465, I-65, I-70 and I-74 is ideal for residents working downtown or at the many employment centers near the property. The downtown CBD and Indiana University–Purdue University Indianapolis (29,000 students) are both less than ten minutes to the east. The Indianapolis International Airport is less than ten minutes to the west. Over 65 million square feet of industrial / distribution / office space lies within 15 minutes of the property (near the airport and along the four interstates). Opportunity to Acquire Stable Property at Attractive 8.8% Cap Rate on Achievable Forecast NOI: Occupancy at the property has been above 90% for each of the last five months and has averaged 94.3% for the trailing three months through December. The offering price represents an 8.8% cap rate on projected NOI. Excellent Community Amenities and Unit Features: Community amenities include a playground, a large clubhouse with leasing office, community room, fireplace, kitchen, and a heated indoor swimming pool, and available covered parking. Units feature spacious floor plans, private patios or balconies, large closets and a full kitchen amenity package. 77% of units include washer/dryer hookups and machines, and the balance are serviced through coin-op locations throughout the facility. Quiet Atmosphere: In spite of its proximity to the Interstate, Suncrest has a quiet neighborhood atmosphere, surrounded on two sides by residential development and buffered on the west by I-465 and south by Washington Street.